The Leica M9 is a curious mixture of the extremely modern and the charmingly old-fashioned. It isn’t a DSLR, it isn’t particularly compact, and because it lacks a Live View mode, it can’t really be classed as a ‘hybrid’ model either. The truth is that like all M-series cameras since the 1960s, the M9 effectively stands alone among its contemporaries. It is for this reason that you will see that we’ve decided not to score it in the same way as we would a DSLR or a compact digital camera. Beginning with the more modern aspects of its specification, at the heart of the M9 is a newly developed 18.5-million-pixel Kodak CCD sensor, measuring 36x24mm. This makes it effectively the same size as a frame of 35mm film. Until now, one of the major barriers to putting a full-frame sensor into a rangefinder was the increased risk of vignetting. This is a consequence of the very short lens-flange-to-focal-plane distance, which can cause severe corner shading, especially with wideangle lenses. Leica’s approach to this problem is twofold. First, modern Leica lenses are ‘chipped’, which means that when mounted on the M9 the camera can identify the lenses by model and apply a certain amount of post-capture adjustment to reduce their particular vignetting characteristics. Second – and more fundamentally – the M9’s sensor features offset microlenses towards the periphery of the frame. By offsetting these microlenses, it is possible to ‘catch’ light hitting the extreme edges of the sensor more efficiently, reducing corner shading in images from chipped and non-chipped optics alike. The sensor’s ISO sensitivity span is 160-2500, with ‘pull 80′ available at the low end of the range. As we have come to expect with extension low ISO settings, at ISO 80 images from the M9 show increased noise and reduced dynamic range compared to ISO 160, which represents the sensor’s actual ‘base’. ISO sensitivity is adjusted on the main 230,000-pixel LCD screen in 1⁄3EV steps. Images are recorded to an SD/SDHC memory card, in either JPEG, DNG (raw) format or both simultaneously, at a maximum frame rate of 2fps. 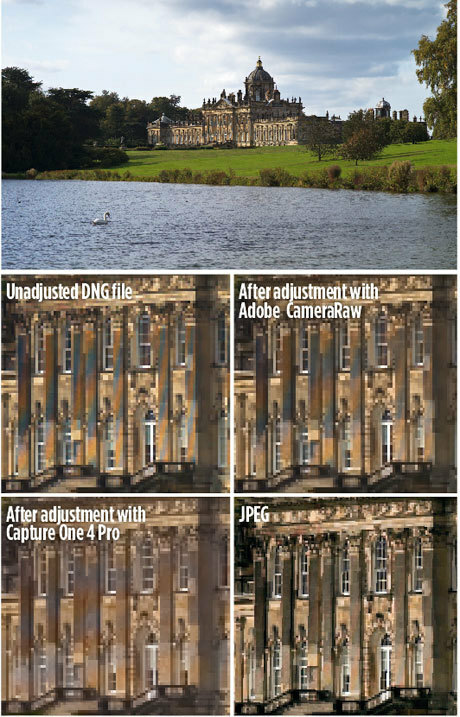 The Adobe DNG (an abbreviation of Digital NeGative) format is a universal raw format that is backwards compatible with all versions of Adobe Camera Raw and a great many other programs, including the bundled Adobe Lightroom software. And that’s about it for the modern. The Leica M system doesn’t support automatic focus, and as a consequence almost all M-mount lenses manufactured since 1954 will fit the M9 with no loss of their original functionality. The M9 features two exposure modes: fully manual, with under/overexposure indicated in the viewfinder; and aperture priority. The shutter is electronically controlled, and shutter speeds are manually adjustable in 1⁄2EV steps from 1/4000sec to 15sec, becoming stepless down to 30secs in aperture priority mode. As the apertures of compatible lenses are entirely mechanical, aperture adjustment is manual, but effectively stepless as well. Habitual DSLR users might be confused, initially at least, by the M9’s viewfinder. Like all rangefinder cameras, the finder of the M9 is effectively just a window that offers, in this case, the approximate field of view of a 28mm lens. At focal lengths between 28 and 135mm the frame coverage is indicated by ‘brightlines’ that change depending on the lens mounted. Lenses wider than 28mm must be used with accessory finders, but focusing remains possible only via the main coupled viewfinder, using the small focusing rectangle in the centre of the image. Traditionally, Leica cameras have justified their high price tags in two main ways: mechanical reliability and image quality. Apart from the reassuring fact that it hasn’t fallen to bits in my hands, I’m not in a position to judge the M9’s reliability after only a few thousand frames. As for image quality, I can report that the camera excels. Viewed technically, some of the images I have taken with the M9 are among the best I’ve seen from a digital camera of this format. The dual-pronged approach to reducing vignetting is very effective, and corner shading is minimal, even in pictures taken at very wide apertures at close focusing distances. There is some vignetting, naturally, but nowhere near as much as I’d feared. The lack of an AA filter has two consequences: one good and one bad. The good is that images are sharp and incredibly detailed. The bad is that from time to time, severe coloured moiré patterning appears in images that show areas of high-frequency detail. In the image on the left, the patterning is so severe that Adobe’s Camera Raw software cannot remove it. Remembering that Capture One 4 was bundled with the M8 and M8.2, I downloaded the latest version of Capture One 4 Pro to see whether its in-built moiré patterning removal tool could do a better job. The results can be seen on the bottom. Capture One 4 Pro has almost completely removed the objectionable coloured bands, although yellow and blue saturation in the rest of the image has been reduced as a consequence. Very occasionally, areas of fine detail can be marred by severe moiré patterning. The M9’s processor minimises the effects in JPEG images, but Adobe Lightroom cannot completely remove the patterning in raw files. Capture One 4 Pro features a dedicated moiré reduction tool, which has done a better job, albeit at the expense of yellow and blue saturation.